2014-2019 ALA Centennial Strategic Plan: Our work to enhance the lives of veterans, military and their families provides our members opportunities to serve in volunteer leadership roles within their local Veterans Affairs hospital (Goal 3), which broadens our membership pool (Goal 1) among a target population and builds brand loyalty (Goal 5) with the veterans themselves. The Service to Veterans sub-committee of Veterans Affairs and Rehabilitation replaces the old Field Service and Home Service sub-committees of years ago. Service to Veterans is direct support an individual member provides to a Veteran or Veterans. The intent of the program is for the individual member to use their available resources to provide goods and services to advance the health and welfare of a veteran NOT related by blood or marriage to the member. 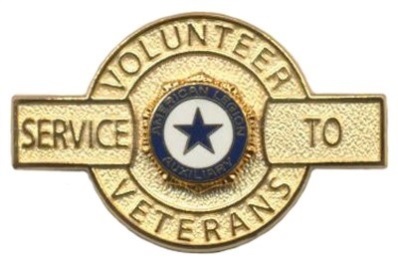 The award for Service to Veterans is an individual member award represented by a pin and hour bar that is attached to the pin. ?1) Assist in activities that help homeless veterans. 2) There isn’t a VA hospital close to your community? Find opportunities for Auxiliary members to serve veterans in your area. These hours will count toward your Service to Veterans pin and hour bars. Service to Veterans recognizes volunteers who provide service to veterans, service members and their families outside a VAMC. Volunteers conduct projects and work for military/veterans and/or families from their homes and in their communities including volunteering at Fisher Houses. Service to Veterans volunteers maintain their own recordkeeping and dollars spent. The Service to Veterans pin has been designed to reflect the work of those who volunteer in their communities and at home for veterans. Hour bars, which attach to the pin, are also available to earn. More information may be in the Veterans Affairs & Rehabilitation: A Guide for Volunteers available online for download at www.alaforveterans.org. To purchase a printed copy, please visit www.emblem.legion.org. Sew quilts for the Quilts of Valor Foundation. For more information, please visit www.qovf.org/. Organize transportation for veterans to assist them with essential errands or medical appointments; many live far from a VA facility and shouldn’t be driving if they don’t feel well. Contact the Legion Service Officer at your post and offer to be on the list of people to call when a military family needs help. Buy school supplies, throw a baby shower, or send care packages to military kids who are headed to college. Report your Service to Veterans hours to your unit VA&R chairman. See Awards section of this plan for information on Hour Bar Recognition. Become the catalyst to find needs and encourage members to help veterans in their community. Provide hospitality for a job fair for veterans. Coordinate with local quilt shops to help your unit sponsor a quilting event in support of Quilts of Valor. Contact members, including those who never or only occasionally attend meetings and events and invite them to participate for specific limited duration projects that would help area veterans. Compile and record hours provided by your members. Coordinate with your PR chairman to tell the community what work your unit members are doing for veterans. VA&R Awards Deadlines and Submission Requirements - Taking the time to share a favorite story about the positive impact you or someone you know has had on our mission is worth doing! It helps us tell the world who we are, what we do, and why we matter. Send to Department VA&R chairman postmarked or emailed by 5 p.m. on the deadline listed above. Send to national division chairman postmarked or emailed by 5 p.m. EST on the deadline listed above. Mid-Year Reports -- Due December 5, 2018. Each Unit is required to submit a narrative report by December 5, 2018 to the Department Service to Veterans Chairman. Year-End Reports -- Due April 15, 2019. Each Unit is required to submit a narrative report by April 15, 2019 to the Department Service to Veterans Chairman. Please submit a narrative report describing how members earned their Service to Veterans hours. Please include pictures and clippings if appropriate. Other How To Sheets can be found at www.ALAforVeterans.org.